181 Beacon is located on the south side of Beacon, between Berkeley and Clarendon, with 179 Beacon to the east and 183 Beacon to the west. 181 Beacon was built ca. 1863, one of two contiguous houses (181-183 Beacon), designed as a symmetrical pair with arched entries. They were originally numbered 179 and 181 Beacon, but were re-numbered as 181 and 183 in about 1868, after a new house had been built immediately to the east and numbered 179 Beacon. The 42 foot wide lot for 181-183 Beacon was assembled in two transactions by real estate dealer Henry Whitwell. He acquired the bulk of the land on May 5, 1860, from Horace Binney Sargent (along with land further east, which he subsequently sold to Albert and Margaret Hall, who built 179 Beacon). He acquired the western four feet on April 5, 1862, from William B. Rice (who had purchased a 25 foot lot from Horace Sargent; 185 Beacon would later be built on the western 21 feet). All of the land was part of two parcels originally purchased from the Commonwealth of Massachusetts on February 10, 1860, and March 7, 1860, by Norman Munson. 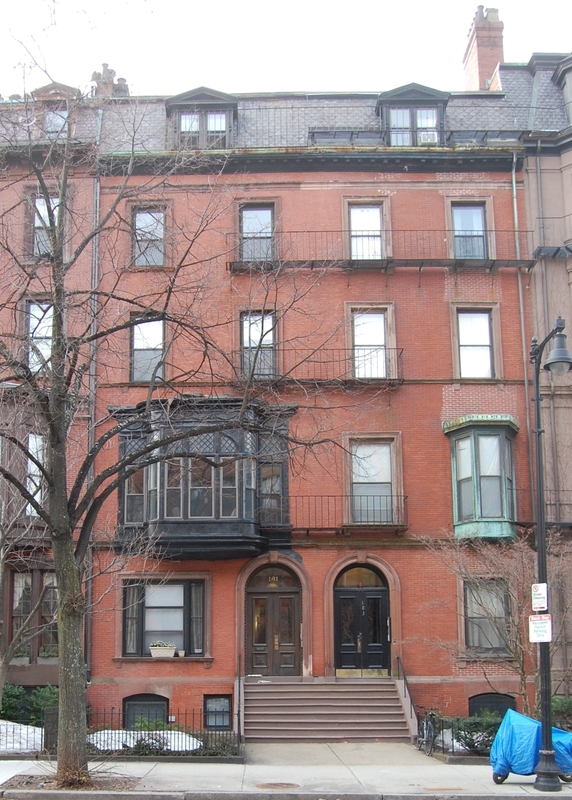 He and his partner, George Goss, were the contractors responsible for filling the Commonwealth’s Back Bay lands. Click here for an index to the deeds for 181 Beacon. On April 9, 1862, Henry Whitwell sold the western half of the lot to Nathaniel Silsbee, where he built his home at 183 Beacon. Henry Whitwell retained the eastern half where he had 1881 Beacon built for speculative sale. On October 6, 1863, 181 Beacon was purchased from Henry Whitwell by James Maguire. He and his wife, Mary (Burrell) Maguire, lived in Randolph, where he was a boot and shoe manufacturer. 181 Beacon became the home of the Maguires’ son, George E. Maguire, and his new wife, Sarah Appleton (Locke) Maguire, whom he married in November of 1863. He was a boot and shoe dealer in his father’s firm. They continued to live there in 1865, but then moved to Randolph. On October 28, 1865, 181 Beacon was purchased from James Maguire by William Parsons, a merchant. He and his wife, Georgianna (Georgiana) Brackett (Messer) Parsons, made it their home. They previously had lived in Newton, where they continued to maintain a home. Their six surviving children lived with them: William Parsons, Jr., Martha Parsons, Francis (Frank) Parsons, Georgianna (Georgiana) Parsons, Lucy Rogers Parsons, and Arthur Jeffrey Parsons. William Parsons, Jr., a dry goods commission merchant, moved to New York City in the late 1860s. He married in March of 1871, in Cincinnati, to Georgiana Williamson. Lucy Parsons married in April of 1876 to Mark Hopkins, Jr., of Williamstown, where they lived after their marriage. William Parsons died in July of 1885. Georgianna Parsons and their unmarried children continued to live at 181 Beacon . Georgianna Parsons and her unmarried daughters, Martha and Georgianna, continued to live at 181 Beacon during the 1887-1888 winter season, but moved thereafter to a new home she had built at 250 Beacon. 181 Beacon was not listed in the 1889 Blue Book. On December 20, 1888, 181 Beacon was purchased from William Parsons’s estate by Arria (Niles) Morrill, the wife of Dr. Ferdinand Gordon Morrill, a physician. He also maintained his medical office there. They previously had lived (and he had maintained his office) at 361 Boylston. They also maintained a home, Pine Knoll, in Magnolia. 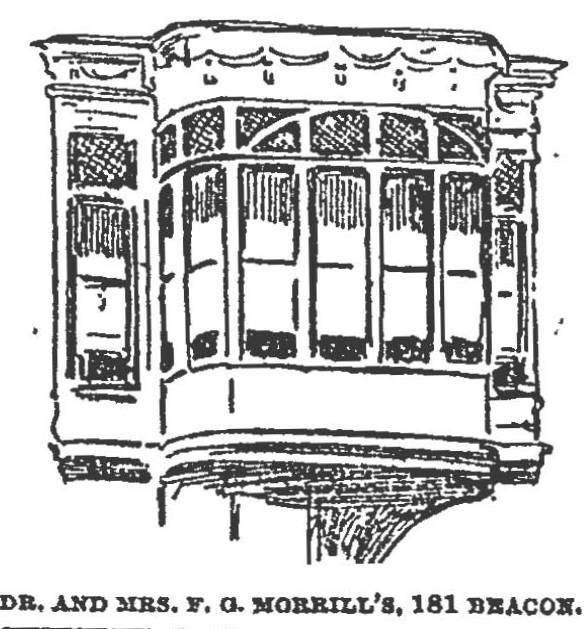 Soon after acquiring the house, the Morrills added a wide oriel window (which is not shown on the 1883, 1888, and 1890 Bromley maps, but does appear on the 1895 map). The window below the oriel also appears to have been widened, probably at the same time. The Morrills continued to live at 181 Beacon in 1892, but were living elsewhere during the 1892-1893 winter season, and 181 Beacon was the home of woolen manufacturer Frederic Simmons Clark and his wife Isabella (Talbot) Clark. They moved to 56 Commonwealth later in 1893, and 181 Beacon was once again the Morrills’ home. The Morrills were once again living elsewhere by late 1899. During the 1899-1900 winter season, 181 Beacon was the home of Edward Robinson and his wife, Elizabeth Hebard (Gould) Robinson. They previously had lived in an apartment at Haddon Hall at 282 Berkeley. Edward Robinson was an archaeologist, curator of classical antiquities for the Museum of Fine Arts, and a lecturer on antiquities at Harvard. In 1905 he became director of the MFA and later became director of the Metropolitan Museum of Art in New York City. By the 1900-1901 winter season, the Robinsons were living at 200 Beacon. During the 1900-1901 winter season, 181 Beacon was the home of author Winston Churchill and his wife, Mabel Harlakenden (Hall) Churchill. He was living there on December 17, 1900, when he met and dined with the English Winston Churchill, who was on a lecture tour of America. Winston and Mabel Churchill also maintained a home, Harlakenden House, near Cornish, New Hampshire. By the 1901-1902 winter season, the Morrills once again were living at 181 Beacon. From 1903, 181 Beacon was also listed in the City Directories as the home of William Fisher Wharton and his wife, Susan Carberry (Lay) Wharton. They previously had lived in Groton, where they continued to maintain a home. William Wharton was an attorney and had served as Assistant Secretary of State in the Benjamin Harrison Administration. Dr. Morrill was not listed in the City Directories for 1903-1905, and the Whartons were not listed in the Blue Books for the same period. It appears likely that the Morrills lived there during the winter season and the Whartons lived there during the rest of the year. By the 1904-1905 winter season, the Morrills were no longer living at 181 Beacon (Dr. Morrill died in December of 1907 in Egypt), and it was the Whartons’ home during the 1905-1906 and 1906-1907 season. They had moved by the next season and were living at 168 Beacon by 1908. By the 1907-1908 winter season, 181 Beacon was the home of insurance broker Henry Rogers Dalton and his wife, Florence (Chapman) Russell. They previously had lived at 507 Beacon. On March 31, 1908, Henry Dalton purchased 181 Beacon from Arria Morrill. Henry Dalton died in September of 1914, and Florence Dalton continued to live at 181 Beacon until her death in March of 1917. 181 Beacon was not listed in the 1918 and 1919 Blue Books. During the 1919-1920 winter season, it was the home of Edward Motley Pickman and his wife, Hester (Chanler) Pickman. He was an author and historian. On August 12, 1921, 181 Beacon was acquired from the Dalton family by banker Daniel Ammen de Menocal. He and his wife, Beatrice Wells (Crosby) de Menocal, made it their home. They previously had lived at 4 West Hill Place. They also maintained a home in Newport. 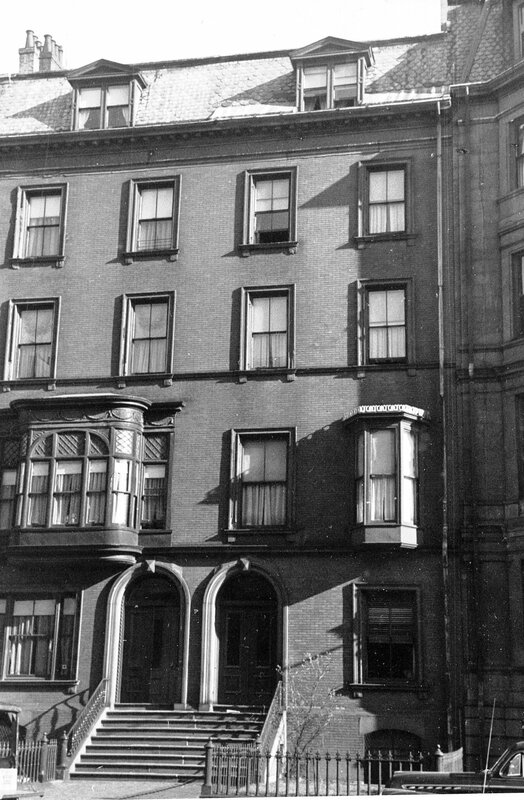 The de Menocals continued to live at 181 Beacon until about 1946. On August 29, 1946, 181 Beacon was acquired from Daniel de Menocal by Mary A. (McNaught) Walton, the widow of David Henry Walton. She was the president of Walton Lunch Company, founded by her husband, which operated a chain of lunchrooms in the Boston area, and also of the Commonwealth Improvement Company, a commercial real estate management company. She continued to live at 181 Beacon until about 1951. 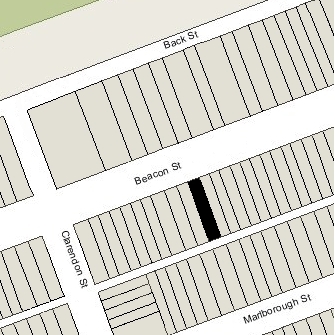 181 Beacon was shown as vacant in the 1952 City Directory. On June 1, 1953, 181 Beacon was acquired by Fisher College, which operated it as a dormitory. In June of 1959, Fisher College acquired 183 Beacon, and that same month it filed for permission to combine 181 and 183 Beacon for use as a dormitory, and to replace an existing wooden shed behind the buildings with a new masonry addition which would be a dining and social hall. The permit was denied but the Board of Appeal granted Fisher College’s appeal on July 15, 1959. The college subsequently abandoned the project, however, and kept the two buildings as separate dormitories: Andrew Hall at 181 Beacon and Myron Hall at 183 Beacon. In June of 1974, Fisher College applied for permission to convert 181 Beacon from a dormitory into a shelter for homeless children under a program funded by the Massachusetts Department of Public Welfare. The application was approved, but it is unclear whether the property was ever used for this purpose. On August 28, 1975, 181 Beacon was purchased from Fisher College by James C. Lawless and his wife, Christina H. Lawless, trustees of the Jean Realty Trust. 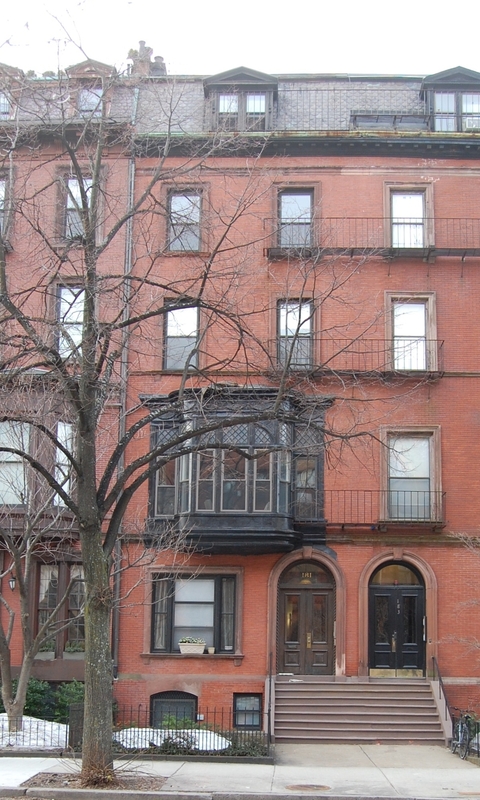 On December 12, 1985, James and Christina Lawless converted 181 Beacon into six condominium units, the 181 Beacon Street Condominium, and In April of 1986, they filed for (and subsequently received) permission to remodel the property into the six residential units they previously had designated as condominiums. As of 2015, they continued to own all of the condominiums, renting them as apartments.